Snoring is common (up to 60% men and 40% women aged 35-60 snore). 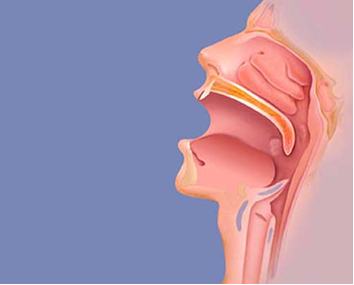 A large percentage of snorers have undetected sleep apnoea. 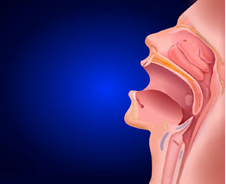 It is important to identify the simple snorers from the sleep apnoea patients. There are some simple tools such as EPWORTH SLEEPINESS SCORE (ESS) which is a 20 point score system which may help you identify possible sleep apnoea. However some Patients with low ESS can still have sleep apnoea. The best tool is (in combination with history, examination of the patient by a doctor) a DIAGNOSTIC POLYSOMNOGRAPHY (PSG). Treatment options depend on each individual patient and their severity of symptoms. Dr Murali Mahadevan will guide you toward appropriate treatment. Septoplasty: correction of deviated nasal septum and reduction of enlarged inferior turbinates can improve airway. Surgery is a day surgical procedure and has the risks associated with General anaesthetic and bleeding. This does not help patients with multi level collapse of the airway. Tonsillectomy: if the tonsils are enlarged and this can obstruct the airway. Tonsillectomy can improve the obstruction. Traditional tonsillectomy is painful and has the risk of bleeding. Coabalation tonsillotomy is less painful and has a risk of bleeding at the rate of 3%. Again this does not address other collapsing areas in the airway. 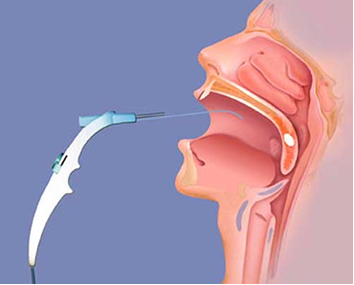 Injection Snoroplasty: injection of sclerosant to soft palate is an effective local anaesthetic procedure for most snorers. Injection of sclerosant Sodium Tertradycel sulphate 3% solution 2mls is injected to 5 different sites. This enables scar tissue to be formed in the soft palate muscle hence stiffens the tissue. Repeated injections can be given to enhance the effect. Day surgical local anaesthetic procedure and back to work in 2 days. Healing takes 1 week but full effect may take 6-8 weeks. Somnoplasty: this is done as a local or general anaesthetic procedure with local anaesthetic spray and injection of local anaesthetic. 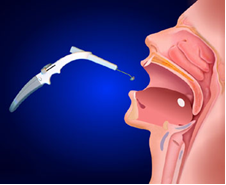 Procedure is aimed at delivering approximately 600J of thermal energy at 50-60 degrees Celsius to the soft palate muscle. The procedure takes approximately 30 mins and done as a day procedure. Most patients have minimal pain which is well controlled with Paracetamol. There will be some swelling and discomfort for 3-5 days and most patients return to work in 3 days. The effects of the procedure take 4-6 weeks by tissue scar formation within the soft palate muscle. Success rate is approximately 70%. 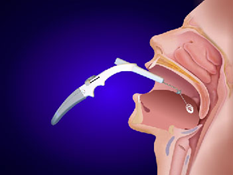 In severe cases the upper airway is very much narrowed and extra space need to be created and therefore requires volume reduction surgery. The surgery is aimed at creating more space in the Retro palatal (behind the soft palate) and retro lingual (behind the tongue) area. The collapsing area is diagnosis by looking with a nasopharyngoscope when sitting, lying down and also with quiet inspiration and expiration. This will give us an idea of collapsing sites in the airway. Some times sleep Nasendoscopy i.e. 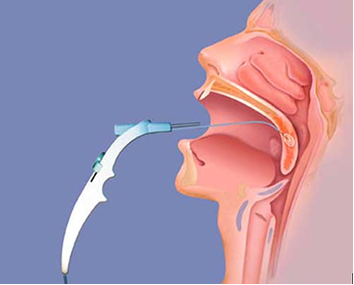 while patient is lightly sleep with intravenous medications, examination with nasopharyngoscope can replicate sleep conditions for us to ascertain areas of collapse. This will dictate which areas to treat i.e. soft palate or tongue base or both. CT scan of the upper airway will also give valuable data as to the volume of tissue that needs removal. Some of the surgeries offered are listed here. For further information and details of surgery please talk to your surgeon.